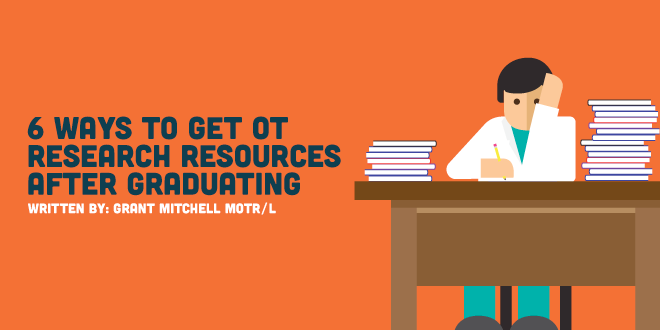 Here is a list of 6 ways you can get your hands on some OT research resources. While a few resources are indeed membership-based, the emphasis is on FREE resources. You’ve heard it before. Your professors say, "Once you graduate, you’ll miss how accessible research from databases are to you now”. It may not be until a year after you graduate that you will suddenly realize just how valuable access to peer-reviewed literature is. For independent practitioners or those belonging to small employers, it may be even more difficult to access research. It’s likely as a new practitioner that FREE OT research resources are even more necessary than when you were a student. Though membership based, there is incredible value in being a member of your professional organization and free research is one of the many perks! American Occupational Therapy Association (AOTA) has all sorts of good nuggets of information to help clinicians. Also, know that AOTA offers a first and second-year new practitioner discount that is paid on a monthly basis. This is far easier to pay than an immediate lump sum, which you probably don’t have room for in your budget just yet. If you want all the important information for OT related research without all the hard work of searching databases, worry not, it’s already been done! Check out the Critically Acclaimed Papers (CAP) on the evidence exchange. Remember, some of the AJOT and OT practice articles and papers are available in PDF to members! Just click on your interest area in the Read Accepted Caps box. While this OT research resource is lesser known, this may be one of the best resources for OT related research. This open-source database remains peer-reviewed none-the-less. Also, if you are looking to publish your work but do not desire to get paid, this may be a great option. With OJOT, you can contribute to a non-predatory organization while being sure to benefit therapists. This resource is FREE so be sure to check it out. While this was a secret resource a decade ago, it may be old news now. In case you forgot, Google Scholar just might have a few articles available freely on the web. It may be a poor selection of specific research, but a broad range of literature may be available. This can be helpful especially if you're addressing broad topics such as politics, business, or patents. Many graduate programs offer fieldwork educators accounts to access the same medical databases their students have access to. If anything, fieldwork students can search themselves for research articles that may contribute to your practice. Don’t feel bad about doling out a few assignments to gather literature to keep your practice current and evidence-based. Oddly, this resource is probably the first forgotten after graduating. Most university libraries are open to the public. If you happen to be in the same town, most universities offer alumni cards if you previously attended. The common drawback is, the databases are often only accessible from computers inside the library. It’s likely you will be able to access every major medical database such as Pubmed and CINAHL. Just download the research articles as PDF’s and save them to a cloud or jumpdrive. Never underestimate the resources available through local public libraries. Aside from access to books, libraries offer the ability to have books ordered if you request. Best of all, local libraries often have databases available to members. Common research databases may include EBSCO Host Health Source and Academic Search Premier. Plus, it’s always good to read. So, check out a good book while you're at it and keep those reading muscles fit!